You can say that I have had my fair share of Thai food in my lifetime. Having spent the earlier part of my childhood growing up south of the border (Thailand’s, that is), I was introduced to this exotic Southeast Asian cuisine at a very early age. Although it resembles my home cuisine in many ways, there are distinctive differences that I learned to discern and appreciate with time. During my early days, Thai restaurants were still quite rare even though I was growing up in that region of the world. These days, you could not stroll down a few blocks of a metropolis without coming across at least one Thai restaurant. In the Dupont Circle area of DC, you can find at least 4 of these restaurants within a quarter-mile radius. A stone throw away in Arlington, VA, I could drive down Columbia Pike and hit at least 3 of them within three minutes. When I was living in Sydney, Australia, in 2008, there was at least one Thai restaurant in every corner of its downtown area, and nearly the same density in some rather affluent suburbs. As the saying goes, you could not avoid them like the plague. So, with the abundance of this Southeast Asian cuisine in the Washington DC area, how does one know if the restaurant is serving authentic and good eats, and is worth visiting? I would say that the answer lies in the fine details and in the gestalt, the totality of the dining experience. Bangkok 54 is one of those locales on that 3-restaurant strip in Arlington. It has been around for quite a few years and over time I have dropped in there a number of times. The business was originally a Thai market that sold delicious home-prepared foods to its customers. In time, it bought over its neighboring lot and renovated it into a swanky Thai bistro. It was one of the first Thai restaurants that I could recall having a modern interior while serving authentically based food – you can find both classic dishes, along with some updated versions of Thai traditional fare. Being a bit of a purist, I decided to taste a myriad of typical dishes and evaluate them as the barometer of its kitchen’s cooking. 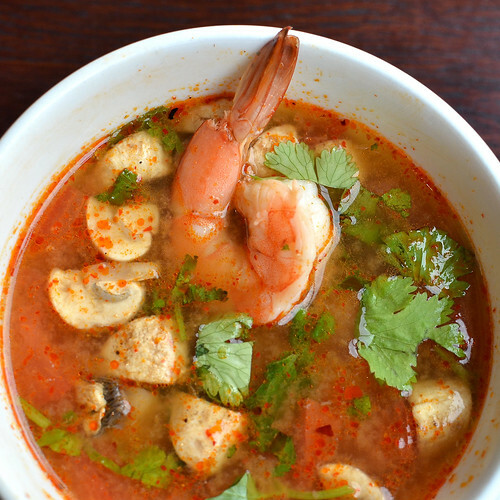 A good measure of a Thai kitchen is its rendition of the classic hot and sour soup, or Tom Yum. Although it is a strong-tasting and aromatic soup, there are some finer points to a well-made bowl. The secret is in the broth that is spiked with citrus lemongrass, rooty and camphor-like galangal, aromatic kaffir lime leaf, biting chili paste, sour lime juice, salty fish sauce, and the addition of a bit of sugar to round of the disparate elements. The restaurant’s version does some justice to this well-known soup that is filled with plump sweet large shrimp and floating pieces of button mushroom. The floating chili oil slick on its surface attests to the spice level that the kitchen does not seem to shy away from – Peht, as they say. On one visit, I decided to order a couple of appetizers as my main course. 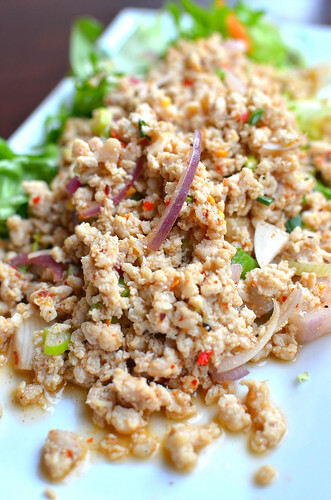 Larb is a minced chicken salad that has been seasoned by lime juice, fish sauce, red onions, and roasted chili flakes, with a faint hint of sesame oil and served on a bed of lettuce. It has quite a fiery bite that is tempered by the sauce and the cool lettuce that serves as its edible bowl. This is not your mother’s chicken salad as it will take you to another place and taste level with its unequivocably strong flavors. Love it. Yum Woon Sen was the other partner in crime. 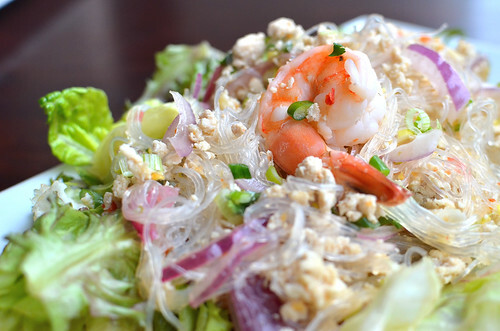 It is a shrimp, chicken, and beanthread noodle salad that has been seasoned with lime juice, fish sauce, red onions, and fresh red chilis. The pieces of chicken were more moist than the previous appetizer, and the beanthread noodle provided a textural difference while having absorbed all the yummy pungent sauce. I could not help but slurp down all the flavorful noodles with pure satisfaction. On a recent visit, I decided to order a couple of standard entrées. On my way out on my previous visit, I had spied on a noodle dish that was coming out of the kitchen, which made me vow to order it on the next visit. 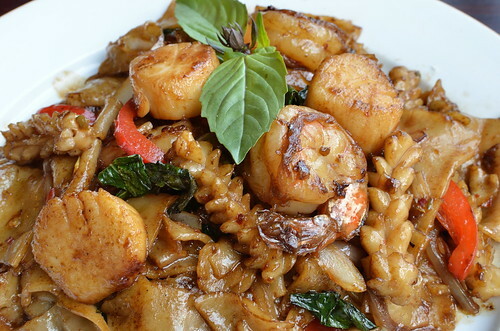 Pad Kee Mao, or the well-known Drunken Noodles, is one of my all-time favorites and it is a must-order when I eat Thai, especially for weekend lunch. This kitchen’s rendition comes with a choice of different meats or seafood, and I decided to go full gusto – I went for the seafood combination. The plate arrived with glossy wide rice noodles that have been well-coated with its slightly sweet brown sauce without any excess grease pooled on the plate, with large chunks of tender squid, shrimp and huge sweet scallops barely hanging on to the noodles as if they are about to roll off a mountain – this was truly a seafood delight. I relished every strand of noodle with the obligatory splash of vinegared green chili condiment that came in a flourescent-red basket. I was in noodle heaven. 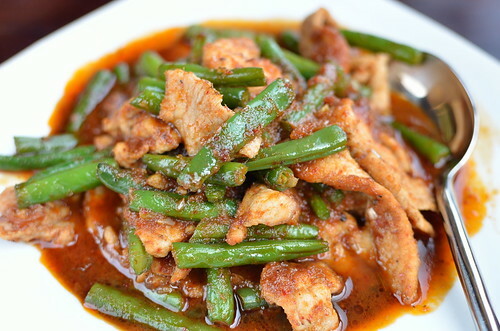 Pad Phrik Khing is a dish of few ingredients, comprised of a choice meat, fresh green beans and a complex spice mix that makes the dish distinctive. The flavor base is made from various roots like lemongrass and galangal, spices like cumin and coriander seeds, and aromatics like Kaffir lime leaves. The dish that I ordered came with large pieces of moist pork, fresh turgid green beans, and a fiery and tasty sauce that pulls the ingredients together. The use of a bit of sugar not only ties in the different flavors but also tempers the spice mix that comes close to overpowering the dish. It is well-cooked but I missed the garnish of thin slivers of fresh Kaffir lime leaves that adds that extra flavor oomph, which I have tasted in other places. However, that did not stop me from spooning all the tasty sauce onto my bowl of fragrant jasmine rice. During my meal, I could not help but constantly eye at the dishes served at the next table over from mine. One of them was a bright orange Butternut Squash in Red Curry, which consisted of a large round of the sweet gourd smothered with a rich coconut-milk based fiery red sauce. Judging by the effusive complements from the lucky recipients, this is going to be on my order list for the next visit. 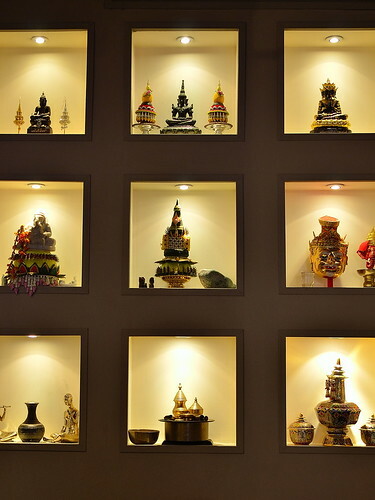 The menu here is extensive and covers a wide variety of Thai classics of rice, meat, vegetables, and seafood dishes. There is also a fairly large vegetarian menu that most Thai restaurants feel obligated to offer as respect for their Buddhist tradition. What sets the dining experience in Bangkok 54 apart from others is the skillful cooking of its dishes (which one can view into the open kitchen), the fine details in its dish presentation and efficient service (including the waitresses’ neatly pressed modern outfits), and the relaxed yet sophisticated well-decorated ambience (large flower sculpture friezes, recessed Buddha statues, deities, and traditional figurines) that allows the diner to relish on along with some good eats. Just like its market that has survived this recession while other area Thai markets have folded-up, Bangkok 54 seems to have the recipe for success, and it will be around for some time to ingratiate more hungry mouths with its offering of this wonderful Southeast Asian cuisine.